Stunning winter displays of beautiful pink flowers! Gorgeous fragrance and attractive foliage. Compact and perfect for small gardens - just 1.5m height and spread over 10 years. Hardy to -6C. Prefers sunny, sheltered locations. Very little pruning or maintenance required. Supplied as an established 2 year old plant in a 9cm pot. 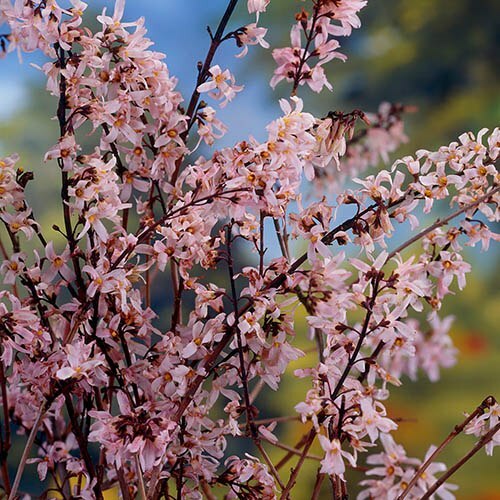 An unusual, but easy to grow compact shrub, producing stunning winter flower displays just as the days start to lengthen to spring. The branches are covered with gorgeously fragrant pink flowers - each one with a yellow centre - which appear on bare stems before the leaves re-emerge. Reaching a compact 1.5m height and spread over 10 years, it is perfect for smaller gardens, and can be grown in large pots for patio use too. It prefers sunny, sheltered locations, and is hardy to -6C or more. Very little pruning or maintenance required.